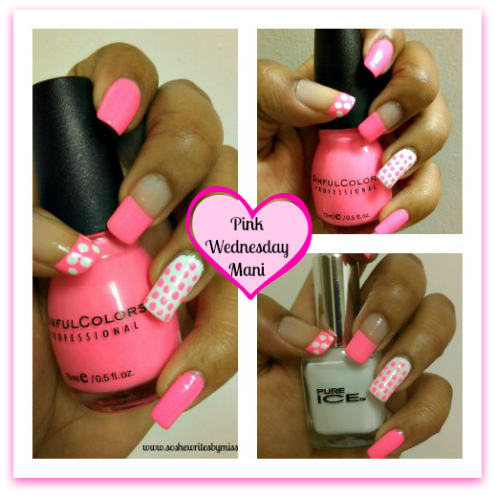 Happy Pink Wednesday, beautiful people! I hope all is well with everyone! This week, I got a little behind on my Manicure Monday post, so I decided to showcase it for Pink Wednesday since it is pink. To fully embrace pink this week, I used the brightest shade of pink I own-- Sinful Colors Nail Polish in Fusion Neon. I tell you, the camera on my phone just doesn't do this color justice. It is shockingly bright! Fusion Neon is certainly an attention-grabber. Now when I chose Pure Ice in Superstar to be my accent nail color, I had no clue what I was gonna do with it. I loved the way my mani came out the last time I used it, but I didn't want to use any glitter this week (trust me, the pink is bright enough). That's when I gave these little polka-dots a try. So ladies, did you get your nails done this week? Did you do them yourself in beautifully bright colors like me? Or did you pass on the polish altogether? Perhaps there is a new mani trend that you are hoping to try (like the caviar nails I plan on doing soon). Either way, I'd love for you to chat it up with me in the comments!